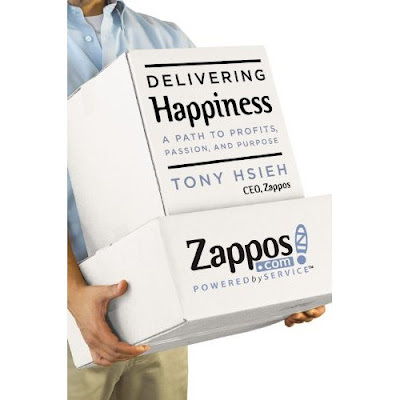 The book of the week was Delivering Happiness by Tony Hsieh. The book is about Zappos.com and the CEO, Tony's life. It was a really awesome book. Part biography, part how-to. It's really interesting to have an author walk you through a first hand account of creating greatness. Quickly, I'll frame Tony's life as described in this book. Tony grew up with aspirations of entrepreneurship from the get go... he had money-making initiatives that included both worm farming and creating custom buttons. I can relate very much with the entrepreneurial spirit at a young age. When Tony hit college he had a pizza selling business where he got the pies from across campus and sold them slice by slice where he lived. He then went on to create LinkExchange which sold to Microsoft for $265 Million. Then went on to work with Zappos.com and in ten years grow it from next to nothing to a $1.2 Billion company. Zappos.com sold to Amazon.com in 2009 but maintains the same operational greatness that got it to where it is. The growing of Zappos was a tumultuous journey and I'm not going to dive into every obstacle they faced because you should just buy the book and read about it. But I do want to dig into one big take away I had... Don't outsource your core competency. Zappos was working with eLogistics to handle all their shipping, however, eLogistics didn't do a good job. After a very challenging time period of having eLogistics butcher the shipping side of their business, Tony and another Zappos member opened up their own warehouse. They told eLogistics that for every week that their warehousing operation outperformed eLogistic's performance they would transfer 10,000 pairs of shoes to their new warehouse. And every single week the Zappos warehouse outperformed eLogistics, so the whole inventory was transfered within a month's time. Tony learned that, since they were in the business of selling and shipping shoes, they should be the one's not only selling but also shipping the shoes. And after that hiccup was worked through, everything started running much smoother. I really want to talk about a very small part of the book for the majority of this post. It's basically the last pages of the book. Tony talks about happiness. It really resonated with me and I have been thinking about it all week long. In one part of Tony's life after he sold LinkExchange he was still working there, as a part of the sale, to ease the transition. If he didn't stay for an entire year then he would be giving up millions and millions of dollars. Well one morning after he had been serving his sentence for a couple months, he hit the snooze button like 7 times. He realized that he wasn't happy with working there and it wasn't worth the millions of dollars he would be forfeiting to continue working out the rest of the year, so he was done. I mean he didn't give away everything, less than half of what his deal was, so he still had plenty of millions of dollars to live off. But still, I don't think there are many people in the world that would sacrifice that kind of money. It came down to happiness for Tony and it should come down to happiness for each and every one of us, but in our busy lives we focus on the easiest way to make the money and they easiest way to do things isn't always the happiest way. These are the needs of all humans, and as you meet the needs of each level of the pyramid you progress to the next level, trying to meet the next set of needs. The book also reference's the book Peak by Chip Conley. In Peak there are three Hierarchy's for business that parallels Maslow's to some degree. I want to focus on the first two. All companies should have a customer service initiative. And that's how we make our way up the ranks of this pyramid. For Zappos, it would be 'the customer gets their shoe's is the first level, then 'free shipping' would be the desire level of the pyramid, and having purchased from Zappos myself, I speak for experience when I say they will meet your unrecognized needs. The example given in the book was a customer getting a free upgraded account for no reason at all. That is the kind of customer service that spread the word of mouth advertising that makes a business a household name. If 9 out of 10 people talk about bad experiences on average and only 1 out of 10 people talk about a good experience, we need to maximize our good experiences and more importantly, we need to not be average. The Employee Hierarchy is so interesting to me. Where are you on your pyramid? I would venture to guess that most of us are sitting at that first level. We do it for the money. Not a whole lot of jobs get constant recognition and I know that there is the slimmest fraction of the world that find meaning in what they do. I have hope for each one of you to really dig down deep and think about what you want from being an employee and making the change necessary. For some of you it will be entrepreneurship, like Tony, and for some of you it might take some digging into what your passionate about and find a field that offers a job where you can grow with that passion. We do not have a guarantee of happiness in this world, but we are guaranteed the pursuit of it. I loved this book. And as always, if you have any questions about anything don't hesitate to ask! Good post. Made me realize that I'm at the top of the Maslow's. However I don't know if I'll ever self-actualize, I'm always expecting more out of myself. Maybe that's what makes people successful though that they never self actualize? If so, can someone with that mentality ever be happy according to Maslow? One school of thought that I like is that happiness can't be a goal or you'll never achieve it. Rather happiness is achieved by reaching goals.